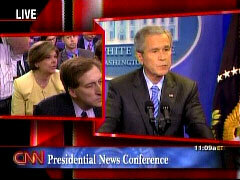 At President Bush's Thursday morning press conference, an Associated Press reporter pressed Bush about raising the gas tax to pay for bridge repairs, an ABC News correspondent described Bush's refusal to hike taxes, while paying for the Iraq war, as in conflict with doing "justice" for "government needs" for bridges and housing and, afterward, CBS's Katie Couric rued how Bush "seemed to dismiss the notion of raising the federal gas tax." CBS reporter Jim Axelrod observed that Bush sees his "strong record as a tax cutter" as part of his legacy and "so even with something as pressing the imagery of the bridges and the infrastructure needs, he can't be seen as calling for a tax increase, even to address that." In the first question at the 10:30am EDT session, the AP's Terry Hunt cited how House "Transportation Committee members are recommending an increase in federal gasoline taxes to pay for repairs. Would you be willing to go along with an increase in gasoline taxes of five cents a gallon or more?" Later, Ann Compton of ABC News reminded Bush it's "been clear you don't want to raise taxes. Can you do justice to the kind of programs the government needs for bridges, for housing, and also continue to spend as much as you do on the war in Iraq?" Two nights after NBC blamed hot summer temperatures on global warming, and on the very day a new scientific report cast doubt on a key assumption behind global warming forecasts, CBS on Thursday evening held global warming culpable for "oppressive August heat" that killed a man in East St. Louis. For an expert assessment, CBS reporter Kelly Cobiella turned only to the Weather Channel climatologist who last year suggested the American Meteorological Society should withhold credentials from any member who dares doubt the man-made global warming mantra: "Dr. Heidi Cullen is a climatologist for the Weather Channel, and sees a definite connection to global warming." Cullen maintained: "The heat wave that we're seeing now is completely consistent with what we expect in a warmer world because all of our models show us that heat waves will become intense, more frequent, and they'll last longer." The CBS Evening News skipped, as Rush Limbuagh predicted the media would, a new study in which, as outlined in a press release, "the widely accepted (albeit unproven) theory that manmade global warming will accelerate itself by creating more heat-trapping clouds is challenged this month in new research from the University of Alabama in Huntsville." On Thursday's Today show it was a tale of two candidates who have fallen behind in the polls. One was eulogized and left for dead, the other one was glowingly profiled. Can you guess which one was a Democrat and which one was the Republican? First, Sen. John McCain sat down on the Today set and had to endure NBC's David Gregory burying his campaign in a set-up piece that was so tough Today co-host Matt Lauer awkwardly apologized: "It's always strange for me to be sitting here with a guy and we're running a tape that's a little bit like a political obituary there." In contrast, NBC's Lee Cowan showcased Sen. Barack Obama playing health care worker for a day as he swept cobwebs from ceilings and fixed breakfast for an elderly man as part of a labor union staged photo-op meant to highlight the inability of health care providers to earn "a living wage." Cowan served up this softball: "What does it say about the state of our health care that you've got a 86-year-old man being taken care of by a 61-year-old woman and you put the two of them together and they probably don't have a living wage?" On Thursday's Good Morning America, co-host Diane Sawyer gushed over new photos of 2008 Democratic presidential candidate John Edwards renewing his wedding vows with wife Elizabeth. Sawyer touted having "the very first pictures of a very personal backyard ceremony." Reporter David Muir also found the pictures to be "incredibly personal," despite the fact that the Edwards campaign provided them to both People magazine and ABC News as part of an obvious campaign publicity effort. And, of course, Sawyer couldn't resist mentioning the story, highly touted in the media, that the couple spends their wedding anniversaries at Wendy's. The GMA host enthused: "And we should say, however, they did also have their ritual anniversary Wendy's burger." This observation came only nine days after GMA's July 31 fawning over the Edwards's trip to Wendy's. 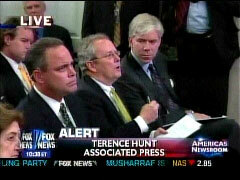 At President Bush's Thursday morning press conference, an Associated Press reporter pressed Bush about raising the gas tax to pay for bridge repairs, an ABC News correspondent described Bush's refusal to hike taxes, while paying for the Iraq war, as in conflict with doing "justice" for "government needs" for bridges and housing and, afterward, CBS's Katie Couric rued how Bush "seemed to dismiss the notion of raising the federal gas tax." CBS reporter Jim Axelrod observed that Bush sees his "strong record as a tax cutter" as part of his legacy and "so even with something as pressing the imagery of the bridges and the infrastructure needs, he can't be seen as calling for a tax increase, even to address that." In the first question at the 10:30am EDT session, the AP's Terry Hunt cited how House "Transportation Committee members are recommending an increase in federal gasoline taxes to pay for repairs. Would you be willing to go along with an increase in gasoline taxes of five cents a gallon or more?" Later, Ann Compton of ABC News reminded Bush it's "been clear you don't want to raise taxes. Can you do justice to the kind of programs the government needs for bridges, for housing, and also continue to spend as much as you do on the war in Iraq?" As for news reports that Bush wishes to cut corporate taxes, Mark Smith of Associated Press radio turned sarcastic: "Do you believe America's corporations are not making enough money these days?" # Terry Hunt, Associated Press: "Mr. President, former Chairman of the House Transportation Committee, Republican Don Young, says there are about 500 bridges around the country like the one that collapsed in Minneapolis last week. And Young and other Transportation Committee members are recommending an increase in federal gasoline taxes to pay for repairs. Would you be willing to go along with an increase in gasoline taxes of five cents a gallon or more?" # Jim Axelrod, CBS News: "Mr. President, I was talking with a journalist about an hour ago in Baghdad who says to be a cynic in Iraq is to be naive at this point, that there is discernable progress, undeniable progress on the battlefield, but there is just as discernable and undeniable lack of progress on political reconciliation. Given the premise of the surge is to give the Iraqi government breathing space to gets its business done, given that they're not getting their business done, are the American people entitled to hear from you more than, 'I've told Prime Minister Maliki he's got to do better?'" # Peter Baker, Washington Post: "Thank you, sir. A two-part question. The New Yorker reports that the Red Cross has found the interrogation program in the CIA detention facilities used interrogation techniques that were tantamount to torture. I'm wondering if you have read that report and what your reaction to it is? And the second part of the question is, more than a year ago you said that you wanted to close the detention facility at Guantanamo, and a year later nothing has actually happened in that regard. Your Vice President, Attorney General and Homeland Security Secretary are reported to be resisting such a move. I wonder if you could tell us who's really in charge on this issue, are you doing anything about it, do you expect Guantanamo to be open or closed when you leave office?" # Mark Smith, Associated Press Radio: "Mr. President, are you considering a plan to cut corporate taxes? Do you believe America's corporations are not making enough money these days?" # Ann Compton, ABC News: "You've been clear about saying that you will veto overspending by Congress when they come back next month to do appropriations bills. You've also been clear you don't want to raise taxes. Can you do justice to the kind of programs the government needs for bridges, for housing, and also continue to spend as much as you do on the war in Iraq?" 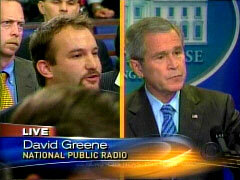 # David Greene, National Public Radio: "Mr. President, I wanted to ask you about accountability. You're a big believer in it, you've talked about it with regard to the public schools. But given the performance of Iraqi leaders, given your decision to commute the sentence of Lewis Libby, you've also stood by the Attorney General recently -- there have been a lot of questions about your commitment to accountability. And I'm wondering if you could give the American people some clear examples of how you've held people accountable during your presidency?....If I could follow -- sorry. Given the decision to commute the sentence of Libby and given the performance of Iraqi leaders, is it fair for people to ask questions about your commitment to accountability?" COURIC: Let's go to Jim Axelrod who is in the White House briefing room. Jim I'm surprised the President wasn't really pushed more on infrastructure questions, and he seemed to dismiss the notion of raising the federal gas tax to pay for some, what, quarter of the American bridges that are in desperate need of repair. Do you think the pressure will continue on him to do something about setting his spending priorities, or, or, setting different priorities when it comes to federal spending? AXELROD: I don't think there's any question about that. Congress will continue to push for it. But the President was very clear, sort of underscoring a philosophical underpinning of his, which is that you don't need to raise taxes, you just need to be more careful about how you are spending money, especially when it comes to those infrastructure, transportation related expenditures. He was saying, "look, a lot of money gets appropriated for transportation in this country. It's up to Congress if they want to spend it different, for instance, in pursuit of infrastructure needs. It's up to Congress to spend it more efficiently and better." But he was clear that he doesn't, he doesn't support any sort of gas tax related tax increase. COURIC: And, and Jim, his comments were really pointed in terms of really accusing committee members of, of, of financing and funding pet projects first and foremost, and than really caring about the nation's infrastructure as a whole as a secondary issue. AXELROD: I think as the President gets further and further along in his presidency and begins to think more of legacies issues, one of the things that is most closely associated with the President, obviously is the strong record as a tax cutter. He is tied to this in terms of history, and so even with something as pressing the imagery of the bridges and the infrastructure needs, he can't be seen as calling for a tax increase, even to address that. So it becomes a question of how you're going to justify getting the money spent there, but not doing so by calling for a tax increase. Two nights after NBC blamed hot summer temperatures on global warming, and on the very day a new scientific report cast doubt on a key assumption behind global warming forecasts, CBS on Thursday evening held global warming culpable for "oppressive August heat" that killed a man in East St. Louis. For an expert assessment, CBS reporter Kelly Cobiella turned only to the Weather Channel climatologist who last year suggested the American Meteorological Society should withhold credentials from any member who dares doubt the man-made global warming mantra: "Dr. Heidi Cullen is a climatologist for the Weather Channel, and sees a definite connection to global warming." Cullen maintained: "The heat wave that we're seeing now is completely consistent with what we expect in a warmer world because all of our models show us that heat waves will become intense, more frequent, and they'll last longer." The CBS Evening News skipped, as Rush Limbuagh predicted the media would, a new study in which, as outlined in a press release, "the widely accepted (albeit unproven) theory that manmade global warming will accelerate itself by creating more heat-trapping clouds is challenged this month in new research from the University of Alabama in Huntsville." The posting on the university's site summarized the study published in a scientific journal: "Instead of creating more clouds, individual tropical warming cycles that served as proxies for global warming saw a decrease in the coverage of heat-trapping cirrus clouds, says Dr. Roy Spencer, a principal research scientist in UAHuntsville's Earth System Science Center." Instead of creating more clouds, individual tropical warming cycles that served as proxies for global warming saw a decrease in the coverage of heat-trapping cirrus clouds, says Dr. Roy Spencer, a principal research scientist in UAHuntsville's Earth System Science Center. That was not what he expected to find. The results of this research were published today in the American Geophysical Union's "Geophysical Research Letters" on-line edition. The paper was co-authored by UAHuntsville's Dr. John R. Christy and Dr. W. Danny Braswell, and Dr. Justin Hnilo of Lawrence Livermore National Laboratory, Livermore, CA. "While low clouds have a predominantly cooling effect due to their shading of sunlight, most cirrus clouds have a net warming effect on the Earth," Spencer said. With high altitude ice clouds their infrared heat trapping exceeds their solar shading effect. The only way to see how these new findings impact global warming forecasts is to include them in computerized climate models. The new results raise questions about some current theories regarding precipitation, clouds and the efficiency with which weather systems convert water vapor into rainfall. These are significant issues in the global warming debate. "Global warming theory says warming will generally be accompanied by more rainfall," Spencer said. "Everyone just assumed that more rainfall means more high altitude clouds. That would be your first guess and, since we didn't have any data to suggest otherwise..."
"Until we understand how precipitation systems change with warming, I don't believe we can know how much of our current warming is manmade. Without that knowledge, we can't predict future climate change with any degree of certainty." Spencer and his colleagues expect these new findings to be controversial. "I know some climate modelers will say that these results are interesting but that they probably don't apply to long-term global warming," he said. "But this represents a fundamental natural cooling process in the atmosphere. Let's see if climate models can get this part right before we rely on their long term projections." 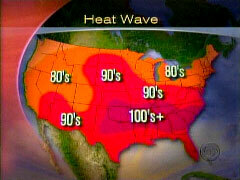 KATIE COURIC: A layer of heat and moisture is hanging like a wet blanket over the Midwest and South. Heat advisories are up throughout those regions for what can be very dangerous conditions. We have two reports tonight, beginning with Kelly Cobiella. KELLY COBIELLA: For the fifth straight day, Americans from Orlando to Indianapolis wilted under an oppressive August heat. Hundreds have been treated for heat-related illnesses since the weekend. In St. Louis, people are being urged to spend the day in shelters, a warning that came too late for 87-year-old James Irby, who died in his home [actually in East St. Louis, Illinois]. He didn't have air conditioning. ALVIN PARKS, Mayor of St. Louis: When I got the news, it just hit me like somebody kicking me in the stomach. I just can't stand the fact that someone might have been saved. COBIELLA: In Georgia and Alabama, where the heat index has been in the 110's, they've also recorded the highest demand for power in each state's history. Metro trains in Washington, D.C., were slowed from 59 to 45 miles an hour because of worries the steel tracks would bend in the heat. And just west of Memphis, hundreds of dead fish have washed ashore, killed off by a lack of oxygen in overheated lakes. HEIDI CULLEN, The Weather Channel: There's a poker analogy that global warming stacks the deck for more extreme events. 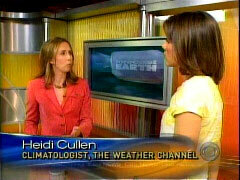 COBIELLA: Dr. Heidi Cullen is a climatologist for the Weather Channel, and sees a definite connection to global warming. CULLEN: The heat wave that we're seeing now is completely consistent with what we expect in a warmer world because all of our models show us that heat waves will become intense, more frequent, and they'll last longer. COBIELLA: This heat wave should taper off in the East by the weekend. But in the Midwest, the misery will continue. Kelly Cobiella, CBS News, Atlanta. On Thursday's Today show it was a tale of two candidates who have fallen behind in the polls. One was eulogized and left for dead, the other one was glowingly profiled. Can you guess which one was a Democrat and which one was the Republican? First, Sen. John McCain sat down on the Today set and had to endure NBC's David Gregory burying his campaign in a set-up piece that was so tough Today co-host Matt Lauer awkwardly apologized: "It's always strange for me to be sitting here with a guy and we're running a tape that's a little bit like a political obituary there." In contrast, NBC's Lee Cowan showcased Sen. Barack Obama playing health care worker for a day as he swept cobwebs from ceilings and fixed breakfast for an elderly man as part of a labor union staged photo-op meant to highlight the inability of health care providers to earn "a living wage." Cowan served up this softball: "What does it say about the state of our health care that you've got a 86-year-old man being taken care of by a 61-year-old woman and you put the two of them together and they probably don't have a living wage?" And Today isn't done highlighting a left-wing union's publicity stunts. Lauer promised: "Hillary Clinton also took up the union's challenge and we're gonna tag along with her next week when she spends the day working as a nurse in a hospital." Matt Lauer: "Now to the race for the White House. At one point Senator John McCain was considered the frontrunner to grab the Republican presidential nomination but recently his campaign has been faltering a bit. So the, can the outspoken Republican senator turn things around? We're gonna talk to Senator McCain, live, in a moment but first a little background from NBC's chief White House correspondent David Gregory. David, good morning to you." David Gregory: "Good morning, Matt. These are the dog days of August but for Senator McCain's White House bid this is make or break time as he tries to rebuild his campaign. A summer of setbacks for the man once considered the GOP's frontrunner. Now, after shaking up his staff and slashing his budget the Arizona senator is relishing his role as underdog and trying to mount a comeback." Sen. John McCain: "I'm confident come September, when people pay attention, we'll replicate the success that we had in 2000 and even more so. That may be difficult." Gregory: "In national polls and in early state surveys, McCain has faded, trying to catch Rudy Giuliani, Mitt Romney and Fred Thompson who is not yet officially in the race. What's happened? The campaign fell well short of its fundraising goals, mismanaged the money it did have and as a result created a storyline of a campaign in turmoil." Byron York, The National Review: "Here's a man who wants to be the chief executive and he talks a lot about fiscal responsibility and cutting spending and it turns out his campaign was going broke and he didn't really know it." Gregory: "Those internal problems were compounded by McCain's stance on the issues. He supports the surge strategy in Iraq at a time when independent voters, McCain's strength, have soured on the war." McCain: "We are winning, we must win and we will not set a date for surrender." Gregory: "Nothing has hurt him more among Republican primary voters than his support for immigration reform." Dan Schnur, former McCain campaign aide: "John McCain, whether it's because of campaign finance reform, whether it's because of issues like global warming, whether it's the immigration issue, he's always gonna have troubles with the Republican Party base." Gregory: "McCain is now running a slimmed-down campaign focused on Iowa, New Hampshire and South Carolina and searching for that maverick touch that can get him back into the race. McCain advisers argue there is a silver-lining here and that is that the race on the Republican side still remains unsettled and in their judgment most primary voters, still, have not made up their minds." Matt Lauer: "Barack Obama has a long list of jobs on his resume: community organizer, lawyer and of course, Senator. Well now you can add home health care worker to that list and it's all because of a challenge from one of the nation's largest unions. NBC's Lee Cowan has that story." Lee Cowan: "At age 86 you're certainly owed a helping hand but not many people get a presidential candidate to clean their house." Sen. Barack Obama: "It takes me back to my bachelor days." Cowan: "Barack Obama took a humbling step off the stump Wednesday and landed in John Thornton's kitchen, mopping his floor, washing his dishes and making his breakfast." Obama: "How does he take his coffee?" Pauline Becks: "Cream and sugar." Cowan: "I think some people may look at some of these pictures and say when was the last time you picked up a mop or washed some dishes?" Obama: "I did laundry, although my wife will say that I was not the guy who folded up the laundry." Cowan: "It was nothing short of a dare from the SEIU, the nation's largest labor union, who put it to all the candidates to take time off campaigning and walk, one day, in someone else's shoes." Anna Burger, SEIU Secretary-Treasurer: "We think that anybody who wants to be president should understand what it's like to be a working person in America today." Cowan: "Mr. Obama had big shoes to fill. Pauline Becks, she's a home health care provider who looks after John. He's 86, he's an amputee and he can't get around without her. She gets just $10.50 an hour for her sometimes back-breaking work and has two foster children to support." Becks: "Oh you have to get a second and third income to survive." Cowan: "What does it say about the state of our health care that you've got a 86-year-old man being taken care of by a 61-year-old woman and you put the two of them together and they probably don't have a living wage?" Obama: "It says that we've got to, we've got to do something more fundamental than just tinkering around the edges." Cowan: "The Illinois Senator got the full dose of her routine. She even made him sweep cob webs off the ceiling." John Thornton: "Do you feel tired?" Obama: "You know I'm worn out." Cowan: "As for Pauline she seemed suitably impressed. He did well, you think?" Becks: "Well we won't go there." Cowan: "Mr. Mom, he's not. But on a day after some big rallies and high-priced fundraisers, Barack Obama seemed genuinely at home. For Today, Lee Cowan, NBC News, San Francisco." Lauer: "I like this concept and by the way, a note, Senator Hillary Clinton also took up the union's challenge and we're gonna tag along with her next week when she spends the day working as a nurse in a hospital. That's Tuesday, right here on Today." GMA co-host Robin Roberts: "It's an anniversary party of sorts at Wendy's. That, of course, presidential nominee John Edwards and his beautiful wife Elizabeth. 30 years. Their 30th anniversary." A transcript of the August 9 GMA segment. Diane Sawyer's tease: "And also in the news this morning, we have the very first pictures of a very personal backyard ceremony for John Edwards and his wife. Elizabeth Edwards is talking in a new chapter for her memoirs 'Saving Graces' about her life right now and the renewal of their vows. And we'll show you those pictures, walking down the aisle again." 7:19am, Diane Sawyer: "Let's turn now to our picture of the morning. And they are new pictures and David Muir is bringing them to us. You've been covering the Edwards campaign." David Muir: "Yeah and this is an incredibly personal photograph that we've now gotten a chance to see. It's the renewal of the vows, the backyard in Chapel Hill, North Carolina. The former Senator and his wife Elizabeth there with their children Kate and the two little ones, Emma Claire and Jack. Apparently this was an idea that they decided to do while they were back at the doctor's office in the spring when they suspected the cancer had come back for Elizabeth. John Edwards asking her, turning to her in the doctor's office and saying, 'Will you marry me again?' And Elizabeth actually told him, she said, she asked back, 'Will you take another 30 years?' And he said, 'Absolutely.'" Sawyer: "Bless her. And you know, she's written a new chapter as well for her book, 'Saving Graces.' And she talks a little more about talking to her children about her cancer and what she's going through. It's a beautiful moment. And we should say, however, they did also have their ritual anniversary Wendy's burger." Muir: "Yes. The fast food. Yeah, which we all can relate to." Sawyer: "They did that as well." Muir: "More of the pictures in People magazine, too." Sawyer: "Right. We thank People magazine for those photos."